If there is one voice that brings all the romanticism in the world to Bollywood, it is that of Arijit Singh. Accompanied by his 21-member troupe for a musical extravaganza 'Arijit Singh Live in Concert - Tum Hi Ho', proved it, enthralling music lovers of Kuwait like never before. The concert, hyped as the ‘Biggest Asian Show of the Year with tremendous pre response’, was organized by Creative Indians Association and Raja Company WLL at the Abbas Al-Ostad Hall located in the Al-Arabi Stadium, Mansouriya on Friday November 21. After the super hit programs "Sunidhi Chauhan Concert" and "Mika Singh Live" once again Prashanth D’Souza, president of Creative Indian Association and a veteran in organizing events in Kuwait joined hands with Rohit G Mirchandani, MD of Raja Company to bring this mega event to Kuwait. After light music by DJ Flames, the main programme kicked off at 7.45 pm with the national anthems of Kuwait and India. Comperes of the evening Lloyd John, Merwin Pereira and Nita Bhatkar introduced the show, followed by foot-tapping group dances performed by Kuwait’s well-known The Dancing Divas (choreographer Jyoti Patel). As a surprise packet, Raja Sagoo, a well-known standup comedian made an entry as Salman Khan and entertained the audience with his humorous questions enacting the popular TV Show 'Sach Ka Dum'. He mimicked Rajinikanth, Dev Anand, Akshay Khanna, Vindoo Dara Singh, Aamir Khan and Ashok Kumar. Upon being named by Merwin Pereira and Nita Bhatkar, he delivered dialogues in the voice of 51 actors which was appreciated by everyone. Prashanth D’Souza along with Rohit G Mirchandani felicitated the sponsors and supporters with mementoes. As a formal inauguration, Indian ambassador to Kuwait Sunil Jain unveiled the souvenir in the presence of Prashanth D’souza and Rohit G Mirchandani and also spoke a few words on the programme. The star of the evening took the stage with his super hit song "Tum Hi Ho" amidst high voltage sound, glittering lights, funny and beautiful female chorus singers, live musicians and packed audience. The crowd jumped from their seats and cheered on with joy unbound. 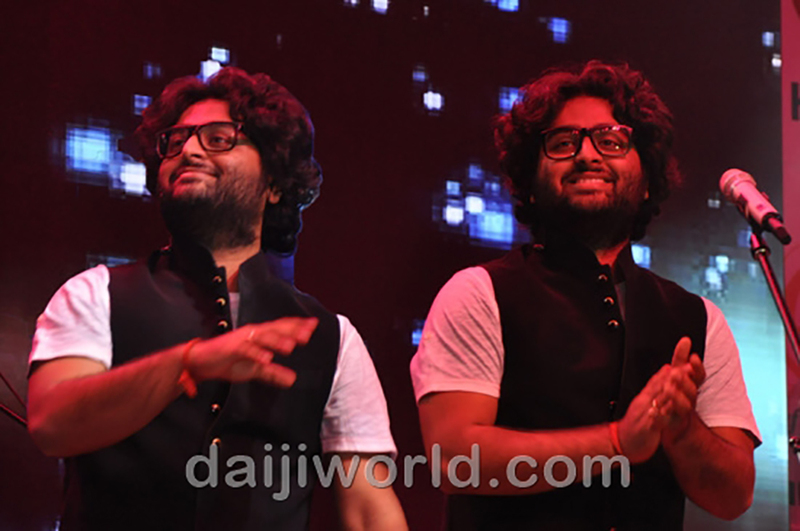 It was exactly what the entire audience had been waiting for - the grand entry of Arijit Singh. Kuwait witnessed an unprecedented scene brimming with joy and overwhelming response. Arijit not only sang his popular songs, he also mesmerised the crowd with melodious oldies, 80's and 90's hits like 'Har kisi ko Nahin Milta', 'Pehla Nasha', 'Kabhi Jo Badal Barse','Ishq Junoon', 'Bheegi Bheegi Raten', 'Phir le Aaya', 'Tum Jane Na', 'Lambi Judai', 'Jo Wada Kiya to Nibhana padega', 'Lagjaa gale se' etc. He also sang some songs with female singer Supriya Pathak. Arijit Singh is Bollywood's latest sensational playback singer who performed in Kuwait for the very first time. The multi award winner mesmerized his audience with an evening of soulful and melodious music. Music lovers in Kuwait were taken through a non-stop musical journey through Bollywood melodies, enjoyed a spectacular evening. He mesmerized the audience for two hours nonstop. Waving the cameras with lights on by thousands of audience as a response to Arijit's performance was a scene never seen before. Arijit catapulted to superstardom in just one year following the huge success of his song Tum Hi Ho from Aashiqui 2 in 2013. He is now one of the most bankable singers within the Bollywood film industry and is renowned for his charismatic voice. The song topped many radio charts and became the 'Love Anthem of the Year'. From his mellifluous rendition of "Phir Mohabbat" from 'Murder 2' or the soulful "Kabira" from 'Yeh Jawani Hai Deewani', to being the musical voice of Aditya Roy Kapoor in 'Aashiqui 2' and giving us immortal hits like "Tum Hi Ho" and "Milne Hai Mujhse Aayi", Arijit is one of the most prominent voices in Bollywood music today. The event was sponsored by VIVA Telecom / Huawei, Burgan Bank, Ashraf & company, GEELY, Al Rashed international Shipping Co, TIK TOK company, GFS, MAKS, Centerpoint, Pizza Inn, Pastamania, Eternity Travel and tours and German printing press. The concert was a treat for any Bollywood fans in Kuwait. An enjoyable mix of foot-tapping and slow romantic songs and an exceptionally talented band of musicians, technicians and singers. Even though some of the audience complained and started fighting as they had to wait outside for a long time due to practice session of visiting artists, at the end every one forgot the same and some of them regretted too for their rude attitude. But without any complaints, it was an amazing evening which will remain in the heart of the audience for a long time. In one word it was a total "paisa vasool show" which Kuwait has never seen before.